Friday the 13the is a happy day for Michael Connelly fans as the entire first season of Bosch is released for immediate watching on Amazon Prime. 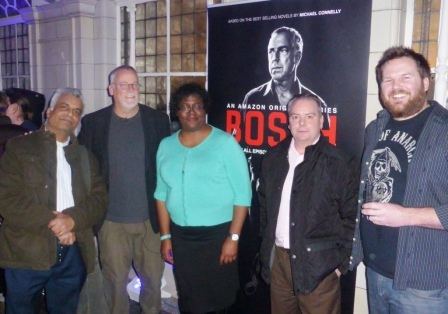 Last week I had the pleasure of attending the London premiere screening of Bosch, the groundbreaking Amazon Prime television series that finally brings one of contemporary crime fiction's greatest characters to the screen. Having recently moved to London from New Zealand for family reasons, I felt very fortunate to get to attend the premiere, for a number of reasons. First, it was great to catch up with Michael Connelly, who I've previously interviewed for national newspapers and popular current affairs magazines in New Zealand. Michael is one of my all-time favourite crime writers, from way back before I became a crime fiction reviewer, author interviewer, and award judge. I remember reading THE POET more than a decade ago and immediately knowing I'd found another terrific author who I'd follow for book after book. In an interesting coincidence, the last time I met Michael in person was in New Zealand four years ago, when I interviewed him onstage for the NZ premiere of The Lincoln Lawyer movie. I remember chatting to Michael at the time about the potential to bring his most beloved character, LAPD detective Hieronymus "Harry" Bosch, to the screen. At the time the rights to the Bosch series of books had been optioned and stuck in 'development hell' for more than a decade, with many false-starts, and Michael seemed fairly resigned to the fact that nothing was on the immediate horizon. But he still had hope. At the time we also had a fun discussion about Matthew McConaughey taking a dramatic turn as Mickey Haller, and pondered who we could envisage ever playing Bosch (it was hard to think of viable candidates). So it was terrific to see things come full circle in a way, meeting up with Michael again for the premiere of a screen adaptation of his books, meeting Titus Welliver (who so brilliantly embodies the quietly relentless nature of the LA detective), and also having a great chat about how McConaughey's dramatic acting career has gone from strength to strength since The Lincoln Lawyer. It was terrific to meet Titus Welliver, who brings Harry Bosch to life onscreen in a way I'd not dared to think was possible. Back when Michael and I chatted about potential screen adaptations, I struggled to think of an actor who could bring it off, as Bosch is such an internal and in some ways non-demonstrative character (despite being a man of dogged action and relentless will). A big name film actor could have got the 'Tom Cruise as Jack Reacher - pfffftttt' backlash from longtime fans, and lesser-known character actors might have been dismissed by some as not having enough gravitas or cachet for such an iconic role. But having watched advance screeners of the first four episodes, boy have I been impressed by Titus. I've seen advance screeners of the first four episodes of the new Amazon Prime series, and for me, he completely embodies Harry Bosch. It's the little things he does, the quiet moments, where he just brings so much to the character. I interviewed Michael a few hours before the premiere, about bringing Bosch to screen, and got some great insights into why Michael wanted Titus to play Bosch, and the challenges of bringing that character to screen. According to Michael, Titus immediately grasped the idea that Bosch isn’t any sort of supercop. He makes mistakes, takes wrong turns, but it’s his dogged pursuit and internal sense of justice that drives him on and enables him to get very bad people off the street. Michael, who was heavily involved in the production, was given a list of a few dozen possible actors, but had seen and been impressed by Titus in another production, and asked why he wasn’t on the list. The reason? He was shooting a movie in Hong Kong, so wasn’t available timing-wise. But in one of those serendipitous things that often lay the planks for onscreen magic, the producers could later bring him to LA for a reading. 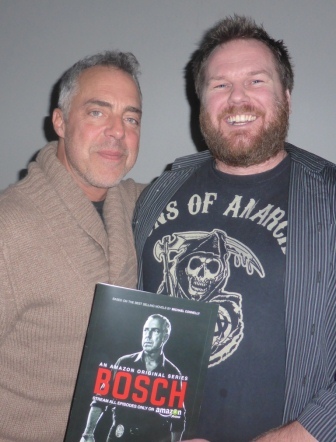 “After his reading, we sent him out of the room, and just looked at each other, and someone said ‘we have our Bosch’,” said Connelly at the premiere. In a very strange way, that I certainly never expected, I already now picture Titus when I think of Harry Bosch. His performance is that powerful, in a good way. As you can see from the photo above, I'm a Sons of Anarchy fan (great TV show), and so I'd been somewhat familiar with Titus as he had a recurring role as Irish gun runner 'Jimmy O' in that California-based series. It was a real pleasure to meet Titus and chat a bit about bringing Bosch to screen. Incidentally, when he saw me at the pre-screening drinks, he yelled out 'Nice t-shirt', with a big grin on his face. 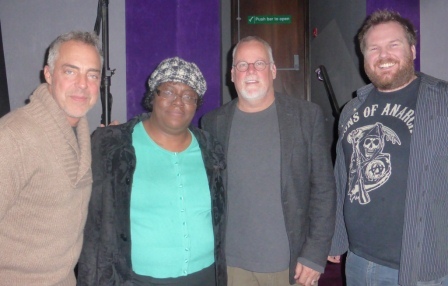 Along with catching up with Michael, meeting Titus, and seeing the reaction of the audience to the absorbing pilot episode, one of the best things about the London premiere of Bosch was getting to share the whole experience with three fellow crime fiction buffs who I'd known online and by email for a number of years, but hadn't met in person until now. In New Zealand I'm used to attending some terrific books events as part of a general literary crowd, where I'm often tabbed as 'the crime guy' amongst media and reviewers. So it has been lovely to meet the Shots magazine team of Ali Karim, Ayo Onatade, and Mike Stotter, who are powerful voices in the crime fiction community. We had a great time together, including having a quiet drink with Michael at a nice little pub down the road afterwards, and I'm looking forward to seeing a lot more of each of them, and others in the British crime fiction community, in the year ahead. The one downside of attending the London premiere (and this is a tiny quibble)? After having watched the first four episodes the night before, and watching the pilot again at the premiere... I have now been champing at the bit to see the entire ten episode of Bosch. The series is beautifully shot - it's really cinematic in nature and tone - and is just an absorbing drama that is quite different to many other things on screen. Titus brings Bosch to life wonderfully, and there are some cracking performances by a high-quality cast of familiar faces (actors from shows like The Wire, and more). The first season mixes plotlines from three of Michael's books - THE CONCRETE BLONDE, CITY OF BONES, and ECHO PARK, in a very intriguing way. I'm very excited that the entire ten episodes of Bosch will all be available for download, perfect for binge-watchers like myself, from Friday 13 February. Amazon Prime is doing things a little differently to traditional television dramas, and I really like it. Incidentally, I believe you can try Amazon Prime free for a month, so now would be a perfect time to sign up (I'm going to), try out Bosch for free, then go from there( see bleow). There had been talk about further series of Bosch if the first one does well (Michael and Titus are both very keen to continue), so if you're a fan of Michael Connelly's Harry Bosch books, make sure you download the TV series, and post comments and ratings etc. Amazon will be using all that feedback to make decisions about filming another series. From what I've seen so far, I think most crime fiction fans are going to be very pleased with how Harry Bosch has finally been brought to screen. 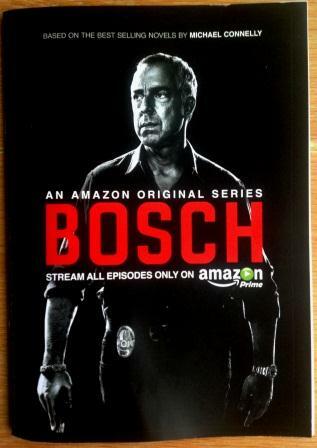 And would you like to win a copy of the BOSCH Amazon Prime Brochure signed by Michael Connelly and Titus Welliver? And EXCLUSIVE to SHOTS.